I'm exhausted, so forgive me if I make this quicker than it deserves. And if I haven't yet been able to jump into a myriad of other elections of serious concern around the country still today. 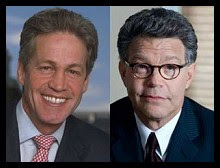 But just a few quick facts on the Al Franken (D) / Norm Coleman (R) U.S. Senate race in Minnesota, which we noted last night  (with some updates today) stands at some 700 votes currently between them. More hopefully after I've figured out how to sneak in some rest. Here are three quick, bullet-point facts that Franken may want to know, since his was the only show on Air America which never had me on as a guest, as he simply refused to discuss serious issues concerning Election Integrity, now - ironically enough. While all of Minnesota  votes on paper ballots, thankfully. Though all of those ballots are scanned, rather than counted, on proprietary optical-scan systems made by either ES&S or Diebold. Both companies produce systems that regularly fail to count and/or record ballots correctly. The majority of counties use the ES&S M-100, precinct-based optical scanner. As we noted on Monday , that same scanner was found, according to a letter sent to the U.S. Election Assistance Commission (EAC) by a county in MI, to have failed pre-election "logic and accuracy testing". The M-100, according to the letter from county officials, “reported inconsistent vote totals", such that “The same ballots run through the same machines, yielded different results each time.” Public Record has more details tonight . In late August of this year, Diebold admitted , while being sued because of it by the state of Ohio, that their GEMS central tabulator system routinely drops thousands of votes, without giving notice, while they are being uploaded from memory cards to the main server. That failed GEMS tabulator model was used yesterday, with both Diebold's touch-screen and op-scan systems, in some 34 states across the country. An automatic recount has been triggered in the Franken/Coleman race, and will take place mid-November. I haven't checked yet as to whether it'll be a machine or hand recount --- hopefully the latter --- but it looks like I have time to find out later (Updated: News accounts say it will be by hand). Either way, hopefully the ballots --- both voted and unvoted --- will be carefully guarded and their chain of custody will be secure, transparent and well-documented between now and then. If you'd like more details on all of these concerns, Al, feel free to contact me. All is forgiven. Sorta. Just as long as you don't concede before every vote is counted, and counted accurately. Republican Senator, and convicted felon , Ted Stevens is leading Democratic challenger and Anchorage Mayor Mark Begich by 48.2 percent to 46.7 percent. Some 49,000 absentee, early votes and provisional ballots remain to be counted. If Stevens wins, it's unclear if he'll resign or face possible expulsion by his Senate peers. If either happens, there's talk of Alaska Governor Sarah Palin running for his seat. Voting System: Alaska uses optical-scan machines made by Premier Election Solutions (formerly Diebold) statewide. Note: Alaska is one of the few places where the Democratic Party actually went to court to fight for transparency against the Electoral-Industrial Complex, successfully suing the state for the release of Diebold databases detailing how voters voted in the 2004 election. The state fought tooth and nail, including the invocation of "security threat" claims, to avoid releasing the information, even after they'd lost the suit. Alaska is very much a Diebold "company town." Additional Note: A source of ours in Alaska, has contacted us to let us know about concerns of "shenanigans" in the counting up there. I hope to get more soon, but I'm told that Palin's Lt. Governor is in charge of overseeing the counting and that some are being denied access from observing the counting. So what's happening up there? Although Ted Stevens holds a small lead in Alaska and is the favorite to retain his seat, the outcome is not as inevitable as it might appear to be. Stevens currently holds a lead of 3,353 votes, or about 1.5 percent of the votes tallied so far. But, there are quite a large number of ballots yet to count. According to Roll Call , these include "at least 40,000 absentee ballot, 9,000 early voting ballots, and an undetermined number of questionable ballots". [T]he polling failures in Alaska weren't unique to Stevens. They also applied to the presidential race, as well as Alaska's at-large House seat. In each case, the Republican outperformed his pre-election polling by margins ranging from 12 to 14 points. Troubling? Um, yup. Silver offers some more numbers and details. Incumbent Republican Senator Saxby Chambliss seized only 49.9 percent of votes  so far, narrowly missing the 50 percent majority that is required in Georgia to avoid a runoff race. Therefore he'll likely face off against Democratic challenger Jim Martin in a December 2 runoff election if some 50,000 absentee and other ballots that are still being counted fail to tip his percentage numbers. Voting System: Georgia uses AccuVote paperless touchscreen machines made by Premier Election Solutions statewide. Note: Speaking of "company towns", GA was the first, along with MD, to adopt Diebold's wholly unverifiable touch-screen systems across the entire state. MD has since decided to replace the system with paper-based optical-systems, following scientific report after report warning about failure after failure with those Diebold touch-screen systems. MD will be replacing them for the 2010 election. The error-prone, easily-hacked, inaccurate touch-screens were first used in 2002 in GA, when Chambliss defeated incumbent Max Cleland in a surprising and controversial upset which has raised many questions about the machines, and Diebold's now-admitted secret patching of the systems, with uncertified software, just before the election. Incumbent Republican Senator Gordon Smith is currently leading Democratic challenger Jeff Merkley by less than 1 percent. Voting System: Oregon uses mail-in paper ballots statewide . It's the only state that has gone entirely postal.